Scottish Jazz Awards finalists Rose Room have become one of Scotland’s leading ensembles influenced by the Gypsy Jazz genre. Sharing a love of Swing music and the style of the great Django Reinhardt and Stephane Grappelli, their “vigorous and vivacious” performances go “down a storm” with any audience as they serve up their 1930s ‘Hot Club’ standards, Gypsy Jazz favorites and self-penned originals with virtuosity, verve and panache recreating the excitement of Rive Gauche Paris. 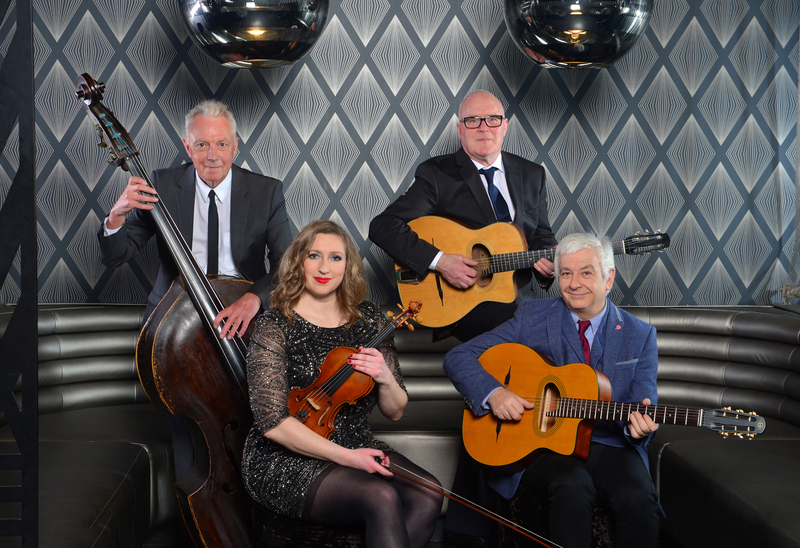 Based in Glasgow, the quartet features award-winning violinist and “sophisticated songstress” Seonaid Aitken Scotland’s No.1 guitar maker Jimmy Moon on double bass, and Danny Kyle Award-winners Swing Guitars’ Tam Gallagher and Tom Watson on rhythm and solo guitars respectively.